I began this week the way millions of Americans did — by watching one of the greatest NCAA men’s basketball championship games in history as the Louisville Cardinals topped the Michigan Wolverines for the title. The next night, their women’s team came up short in the women’s title game against Connecticut. Having two basketball teams from the same school play for titles on back-to-back days is pretty incredible, even if they couldn’t pull off the sweep. During the second half of next week, I’ll be in Louisville. Fuller Center board member Don Erler of Louisville tells me that there is no chance the excitement will have abated by the time I get there. But I’ll be there for something equally exciting and way more important. I’ll be there to document the work The Fuller Center for Housing of Louisville is doing in restoring vacant houses into decent homes for families. They’ll be working on and dedicating five Save a House/Make a Home projects during the Mayor’s Week of Service. I’ve never been to Louisville, but I feel like I know the Shawnee neighborhood from all the pictures I’ve seen from there. I’m eager to witness how The Fuller Center has resurrected this once written-off neighborhood. I’ve never been to Sarasota, either, but maybe I’ll have a good excuse to go now that we’ve inked a new covenant partner there. It’s new, but the roots trace back to when its president served on the Mennonite Economic Development Associates board with current Fuller Center for Housing Chairman of the Board LeRoy Troyer. Click here to see yet another example of how these connections (President David Snell calls them “providential confluences”) keep popping up. “I’m finding it hard to express just what my week in Haiti meant for me and the group I was with,” wrote Micah, who is pursuing his doctorate in clinical psychology. “It was no doubt one of the most powerful experiences of my life. Although only there for a week, I felt truly immersed in the culture. Our guide, Jimmy, did an amazing job of showing us as much of Haiti as possible. 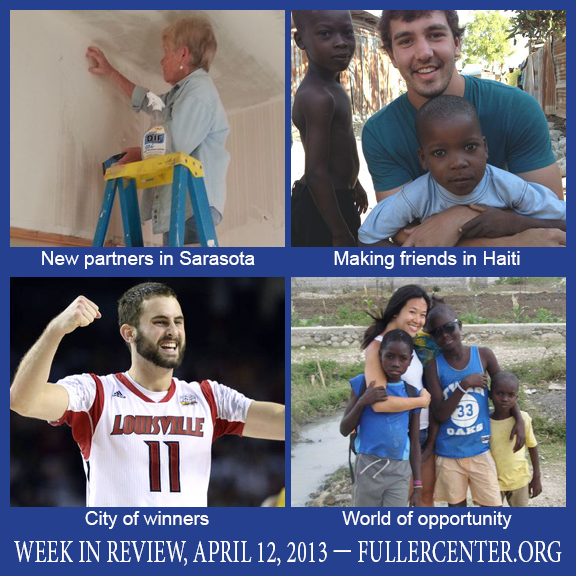 Speaking of Global Builders, the program was the lead entry in our latest eNews. The program is not growing only in number of trips but also in number of destinations. Be sure to check out our latest eNews by clicking here.